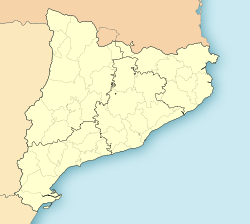 Vallfogona de Balaguer is a municipality in the comarca o Noguera, in the province o Lleida, Catalonie, Spain. Economy is based on agricultur, wi, in pairticular, the cultivation o cereals. Sichts include the pairish kirk o St. Michael Airchangel (18t hunderyear) an a castle, wi a Romanesque chapel (renovatit in the 18t hunderyear) an a square touer o Islamic oreegin. This page wis last eeditit on 11 Mairch 2018, at 12:45.